Click on the image to see a larger picture of the favor. 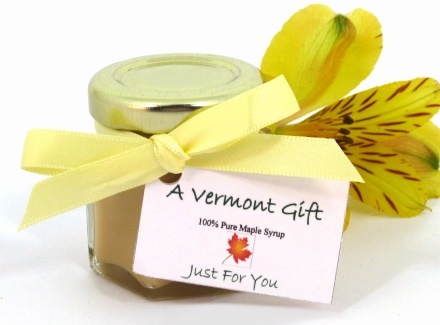 Pure maple cream is extremely popular, so wedfigured, why not offer it as a wedding favor? Well, it's been very popular over the past several years. All you need are tiny spoons and your guests can enjoy the sweet taste of pure maple cream, made from Vermont maple syrup. "Pure maple cream" is very similar to, but it is not maple butter. Maple butter is blended with other ingredients. Maple cream on the other hand is made from pure maple syrup only. Traditionally maple cream is served on breakfast toast, homemade muffins, or bagels, but certainly it can also be enjoyed right from jar just like jam. Open the lid, give it a quick stir, and enjoy! The Maple Cream - Each jar is filled with 2.3 oz. 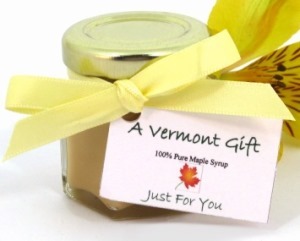 of pure Vermont maple cream, produced in northern Vermont. When should I place my order? What about a gift message? You can place your order at any time, some people even order months in advance. If you need your wedding favors rushed to you, please call us (802-868-4418) first to ensure availability and timely delivery before placing your order. Sale Price: $3.45 You Save: $0.05 (1.43%)! Sale Price: $3.40 You Save: $0.10 (2.86%)! Sale Price: $3.30 You Save: $0.20 (5.71%)! Sale Price: $3.20 You Save: $0.30 (8.57%)!